Ladies finally christmas is just around the corner! Have you already choosen an holidays outfit? Unfortunately i don't because of the lack of time but, if i lived in a warmer place, i would chose the outfit in the photo. 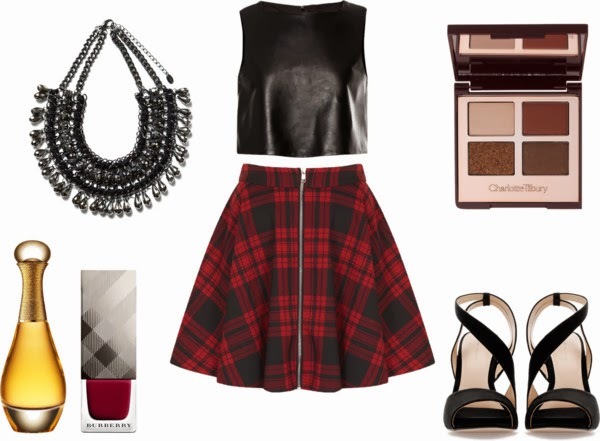 This year i'm in love with skater skirt and the fall-winter trend is the tartan pattern so... i would match it with that leather top and high-heeled sandals. This look is complete with that marvellous necklace. Now you just have to put on that beautiful color on your nails, makeup yourself with Charlotte Tilbury's palette, sprinkle J' Adore L' Or on your skin and you will be ready! What is your favourite outfit for holidays? Comment down below and let me know it! This entry was posted on Friday, 20 December 2013 and is filed under fashion,ootd. You can follow any responses to this entry through the RSS 2.0. You can leave a response. What a beautiful pairing idea! Perfect for the holidays! Thank you for the inspiration! Thank you :) I follow you! Yeah, i know what you mean, i need to buy a lot of clothes for christmas/new year's eve eheheh! Great selection, love tartan pattern. Lovely skirt, love the outfit!